I am traveling today, to the great state of Texas. My grandson, Dayan, who is almost 16, graciously accepted my invitation to be my first guest blogger. And what a treat! Dayan is sharing his award winning short story, which received recognition last week. The Crowder Quill Contest is held annually, and is open to area high school students and Crowder College students. 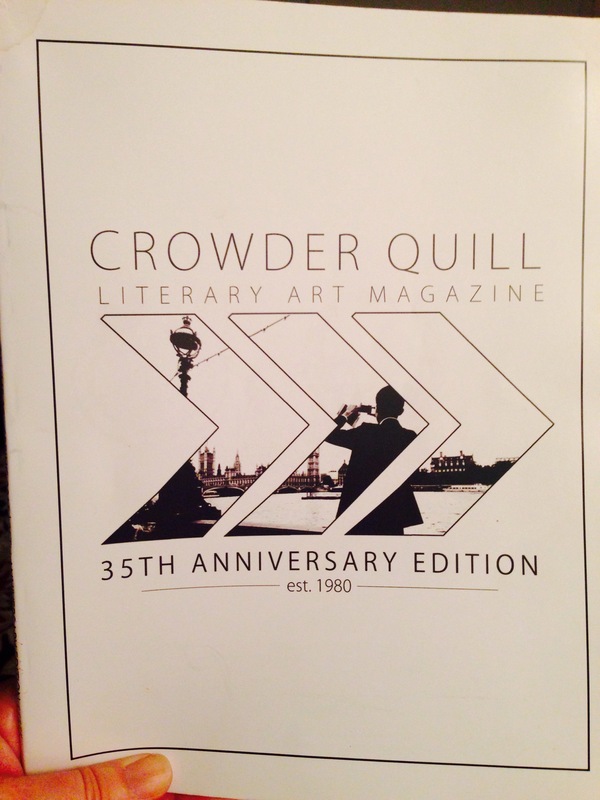 Winning entires are published in the Crowder Quill Literary Art Magazine. Entries are judged in poetry, fiction, nonfiction, art and photography. And now, my guest blogger, Dayan Reynolds, sharing his winning short story. I wrote this piece to explain my view on humanity’s blindness in technology. We cover our eyes and rely on the future to guide us along, but sometimes the future can pull us down to destruction. It’s a Tuesday. The sun rises in the east, its golden rays creeping across the still sleeping city of Ozarka, home to almost 180,000 people. Waves slap lazily against the boardwalk in the harbor. In the distance the searchlights along the top of the distant sea wall glide across the turquoise sea. The wall is relatively new, only two years ago it was nothing but slabs of steel and concrete lying in wait at the shipyard. It is the brainchild of the infamous Dr. Dioti von Maaigen, an oceanographer and engineer who has built several others for cities across the world. The wall has large, metal towers connected by steel walls, which could be raised or lowered to allow for ships to pass in times of calm. The public had voiced their support of it loudly, almost no one opposing the construction of a wall that would practically empty city coffers. Yet, for the past two years, there was a “drought” of seismic activity in the ocean basin, leaving it untested. Dr. Dioti von Maaigen holds an urgent conference with the Mayor of Ozarka, the President of Hevia and a few leading scientists such as himself. Although the professor is the host, the conference soon turns into a heated debate between the Mayor and the President over a proposed interstate bypassing Ozarka. Of the scientists invited to the conference, only two arrive, and both are distracted by experiments they are currently running back at the laboratory in Hevic. The meeting will last for a little over two hours, and throughout it the professor is ignored, his face white out of fear, though he never can share the news he’s discovered. In his trembling hands he holds data and blueprints to the Ozarka seawall. As Ozarka awakens from its slumber, streets fill with school buses containing a total of 24,000 kids. Many people are heading to work, either by roads or using the city’s elevated rail system, which lines downtown. A whistle blows at the Grand City Station, announcing the arrival of a passenger train carrying 215 commuters from nearby Hevic. Younger couples line the boardwalk, while fishing boats glide across the gentle bay. A cruise ship is entering through the seawall gate, creeping across towards the harbor. Crowds develop along the beaches, as today is the third day of the annual Aquatica Festival. Tourists flock to Ozarka to celebrate protection of the sea life across the world. Estimates suggest as many as 20,000 could appear at some point today. Life in the city is humming merrily on track. School bells in Bayview High toll, announcing the start of first hour. Businesses open up, the streets develop a slow stir of people, and the boardwalk roars to life. The bell tower at Hevia State University chimes 8 in a rhythmic tune. Abruptly, the ground shakes. A distant tremor is rumbling, yet despite its intense ferocity – an 8.2 magnitude – the city is practically untouched, as the epicenter lies in the far off ocean. A few windows shatter, and one apartment in a historic part of town collapses, but no other evidence of damage exists. The people and tourists in Ozarka stumble, as the city seems to stutter, then everything goes back to mainstream. The only notable difference in the city is that the sea walls are raised, sealing off the ocean, and any tsunamis with it. There is no fear of a wave of epic proportion, as they have the sea wall, and thus the boardwalks continue to host crowds of people, boats remain buzzing in the harbor, and the school which lies on the south side of the bay, remains open. Nothing abnormal happens for the next two hours. The first reports of a tsunami are arriving. Several rural islands off the coast, which can’t afford protection, have been hit, many going entirely underwater. Additionally, reports are coming in from other nations of a truly massive wave, over 70 feet in height. Predictions suggest that by the time the wave reaches the sea wall, which stands at a mighty high of 64 feet, it should have dropped to 50 feet. Despite the giant death toll, so far numbering over 1000 already, the people of Ozarka are not afraid, for the sea wall stands like a vigilant guard over them. Most in the city are continuing on with their lives. The supermarkets remain full, restaurants open, and even doomsday stores for the Latter Day Saints, the dominant religion here, remain well stocked. An old crippled woman has just left her house in the poor suburb of Northport, heading for a local market to buy fresh produce. She walks in a confident manner down the street, giving friendly hellos and how are yous to the neighbors and passers by. The woman is very happy today, as today is the first day in a year that her grandson will be home from the 101st Airborne Division. A new mother strolls down an avenue in downtown with her child in a stroller. She is taking him along for a shopping spree, though her mind is venturing off to earlier this morning, when she stormed out of her house after she and her husband fought. It ended brutally, and the woman’s last stop will be a law office. She ponders to herself where things went wrong. Across the street a man stands in a jewelry store for the opposite reason. He is hoping to propose to his girlfriend tonight in a luxurious restaurant that, when combined with the ring he has just decided to buy, would empty his wallet. He continues to tell himself that it’s all for her, and his voice cracks with excitement and anticipation every time he opens his mouth to the jeweler. An old professor huddles against a wall, papers latched tightly in one hand and shivering, despite the summer heat. He has just left a conference which went horribly wrong, and despite his warnings, no one who passes by gives him a second thought. So he huddles, awaiting death. The populace is unaware as a 53 foot high wave slams into the sea wall. The populace is unaware as first one bolt flies off, and then another, then another. The populace is unaware as the sea wall, great and mighty, shatters like glass as the great gates collapse back into the ocean, the towers crumbling beneath the tsunami’s weight. The wave speeds inward toward the city. People in boats and on the boardwalk attempt to escape its wrath, but it is to no avail. A cruise ship filled with tourists is tipped over, falling on the beaches, while boat after boat slams into the boardwalk stores. In mere seconds the High School is obliterated, crumbling and becoming shrapnel to use against more victims. The great downtown skyscrapers attempt to stand in defiance, commanding it to halt, but the wave is deaf, and plows over them. The old clock at the college is instantly submerged, and in the moments before death, some people see the vague outline of elevated rail trains being carried inside the tsunami like cannons. In five minutes the city is underwater, the result of a disaster two years in the making. As quickly as it came, it went. The wave recedes, leaving a world of devastation. Over 200,000 people are dead, including 24,000 students, 215 commuters, and 18,000 tourists. As the waters recede, a bag of produce flows by, purchased by an old woman who will never carry them home. Divorce papers and an empty stroller follow suit, belonging to a poor soul who died filled with grief from earlier this morning. A ring box floats past, never arriving to a landmark date this evening. The last thing to come along in this chain of sorrow is a group of blueprints and notes, detailing a fatal error in the Ozarka sea wall. Dayan Reynolds is a sophomore at Carl Junction High School. He describes himself as having a vivid imagination and being a tad eccentric. He enjoys being able to put unique and intriguing thoughts on paper through writing novels. 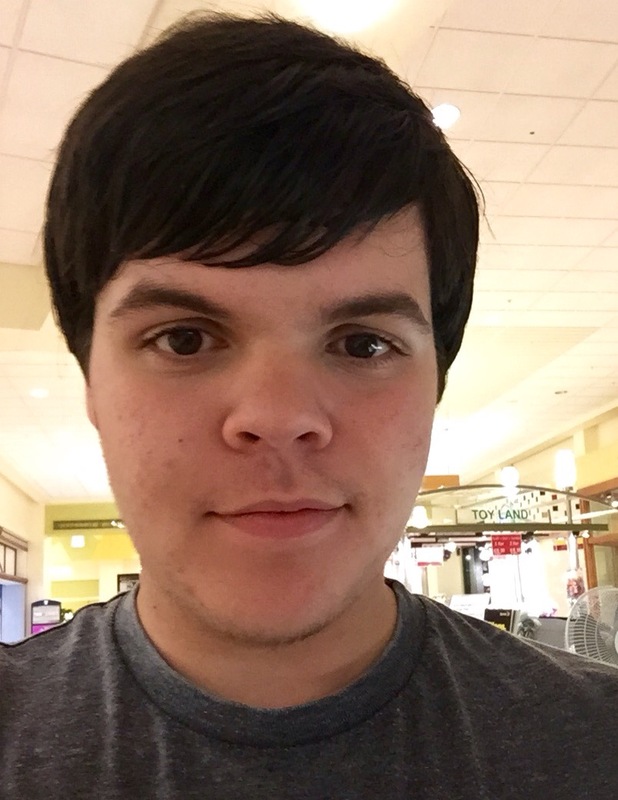 He intends to become a political analyst, working for the government, and to continue writing fiction and nonfiction. Next PostNext Journey 135: Four Funerals…and a Wedding.